Photo: Our facilities are being outfitted with tile finishings which will allow for greater ease of cleaning and a higher standard of hygiene. We are happy to report that we are making progress with the construction for an on-campus high school at our main campus, which should be completed by the end of May or the second week of June. We have laid down the concrete beams to secure the foundation, and we will raise the concrete pillars this week — both will enable us to create a strong, durable building. We decided to start a high school on our campus because our children have to travel very far to attend higher classes, sometimes the girls struggle with social problems, and our children are treated carelessly because they come from families below the standard poverty line — they are of the lower castes and Dalits (outside of the caste system, “untouchables”). Often times culturally, they are considered to be the lowest people in the society, so we want to encourage them, love them, and display their talents to the society, as well as give them sufficient care and protection. There is no high school in this area, so we also hope to offer our high school to the public — not just our orphans living on campus. In other good news, we have begun to outfit all of the rooms on campus with tiles on the floors and walls to help maintain sanitation and promote more ease of cleaning. 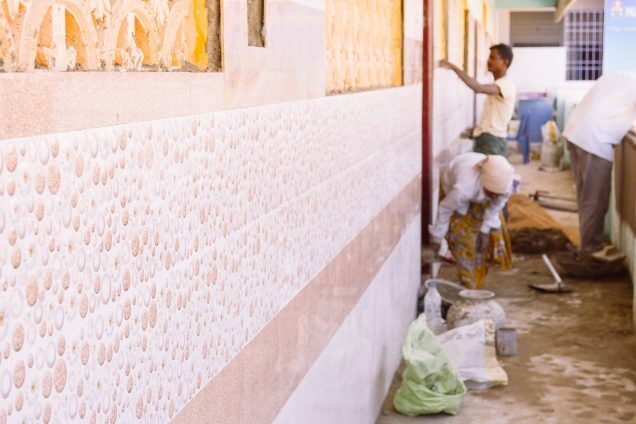 The tile work in the dining hall is complete, and now the tile work is underway in the kitchen, the boys’ and girls’ dormitories, and our 7 classrooms — it should all be completed by the end of May. Our field director in India reported, “Some children are asking me, is it true sir? All of our rooms are going to be fixed with tiles? When I say YES, they are saying we are eager to see this sir.” Thanks to your support and contributions from our generous donors, we also recently added to our campus 4 washing machines, a deep refrigerator, new mattresses, new bed covers and pillows, more dining tables, and a generator. Photo inset: (Top-left): Tile work in our dining hall was recently completed, which will make the area more sanitized and make cleaning up easier. (Top-right): The girls at our orphan home are thrilled with the new tile work in their dormitories and the on-campus high school currently under construction. (Bottom-left): Current construction of the second floor to our Hyderabad Hope Center will allow more room for the children to study. (Bottom-right): The children at our orphan home recently received new dining tables and chairs. With your support we also hope to purchase a half acre of land adjacent to our main campus where we want to build a new playground for the children — we had to dismantle the existing playground in order to build the high school. Purchasing the adjacent land and building a new playground is also important because we need proof of a children’s playground in order to maintain our status as an accredited elementary school with the educational department. In other news from the children’s school, the students will soon take their final examinations for this school year. They have enjoyed studying their native languages of Telugu and Hindi as well as math, social studies, science, and English, faithfully taught by our 4 teachers and 1 evening tutor on staff. We are also thankful that construction continues on the second level of our Children’s Hope Center in Hyderabad, India — everything should be completed this month or in April. Previously we were using the existing ground floor and its two small rooms for a study hall and a computer lab, but it’s been too crowded for the 40 children enrolled this year as we’ve been trying to use the same study hall for preparing and serving meals. The additional second level will become the study room which will give the children a more comfortable and peaceful environment to do their studies and excel in their education, and protect them from a miserable life of child labor, one of the leading precursors to child trafficking in India. Our Children’s Hope Center is bringing hope and happiness to the children of this slum colony located on the edge of the city’s largest landfill. We are extremely grateful for your prayers and faithful support, and we look forward to reporting back with our progress in improving the lives of all of our children.